Plainville Park in Plainville Indiana! A HUGE thank you to everyone who helped make our first half marathon a success! To the fellow board members, sponsors, volunteers, The End Zone, Jimbo's Pizza & Wings, Backroads Advertising, DJ Aaron Brower, Hank's Market, Eastgate Manor, Sheriff's department, Its Your Race timing company, and all of the participants- I truly appreciate each and every one you! Mark your calendars for next year's race: 04/07/2018! Congrats to all of you! You all did a great job! TBF 2017 Steps for Hope Half Marathon 1st Place Women's Division Abby Laux, Travis Burkhart & 1st Place Men's Division John Kensek. TBF 2017 Steps for Hope Half Marathon 1st Place Relay Team Andrew Peter, Travis Burkhart & Clint Ramsey. The Steps for Hope event has been a great event in its first six years. The inaugural run/walk brought 400+ participants together for a great morning of fun. The 2nd annual run/walk was held on I-69 becoming the 1st and only run/walk to ever be held on the interstate! Since the 3rd annual run/walk we wanted to add something new so we added some color! Take a look below to get an idea of how our runs have gone in the past! The 1st annual run/walk was held at the Henry R. Gwaltney Sports Complex and was a great time! We incorporated the fall season into the event and had runners in costume, a costume march for the kids, and the path ran through the country during harvest. We were able to build on the 1st year when as we were fortunate enough to be given the opportunity to hold the 2nd annual run/walk on I-69. The day was a great success and is the only run to happen on the interstate! The Fall Festival in Washington, IN was kicked off in 2013 and 2014 by the 3rd and 4th annual run/walk. 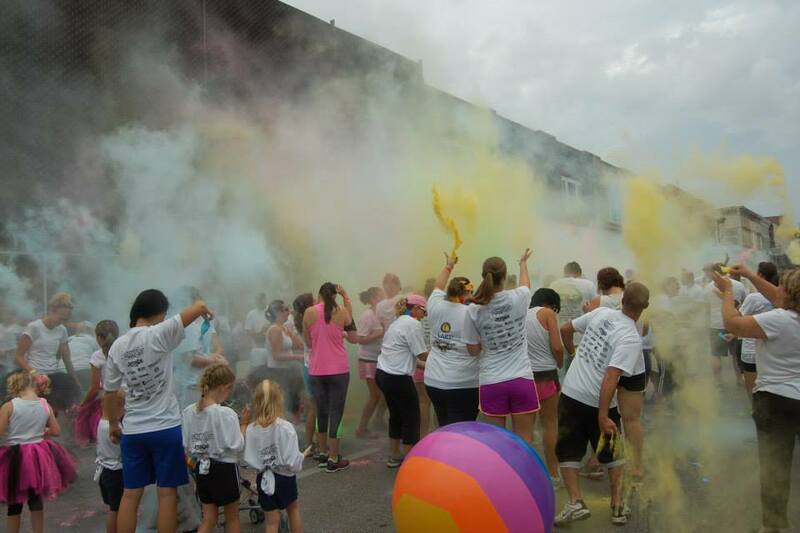 In 2013 & 2014 we added some color to the run and it was a blast! We weathered the rain and had a great morning to kick of a great day!